If you are looking to train up a pet to compete in The Battledome, you may want to consider using one of the tried and true Pet Builds to help guide your training. After all, Commander Garoo has put a great deal of effort into perfecting the training and tactics for his underlings, why shouldn't you? What is a Pet Build? Simply put, a Pet Build is a quick way to describe the balance of a pet's battle statistics. The reason for different Pet Builds is to gain some sort of statistical advantage over another pet instead of trying to gain an advantage with weapons. Some pets are built to deliver punishing attacks, some pets are built to withstand offensive assaults and some pets really aren't built at all. Here are a few commonly seen Pet Builds that you may encounter in the Battledome, as well as some possible advantages and disadvantages. NOTE: Depending on where you look, a pet's HP (Hit Points) may also be called Endurance, Health Points or just Health. Whatever it is called, it really all refers to the amount of damage a pet can sustain before losing a battle. Balanced pets are probably most commonly seen in the Battledome. Pets with a Balanced build should have fairly even stats for HP, Strength, and Defence. Some owners decide not to train their balanced pets in Defence, but it's generally not recommended to ignore your pet's Defence boost especially if you plan to use shields or dual-duty weapons. Advantages: Because the Balanced build is so popular, it can be easy to find opponents with similar stats. Disadvantages: Balanced pets can sometimes be beaten by non-balanced pets in league battles (which can favour pets tuned to a particular formula). Tank pets are pets with much higher Defence than Strength and/or HP. These pets are generally suited for 2-Player competitive battling environments, as 1-Player opponents will eventually get to a point where your Defence won't nearly be as effective (since your opponent's stats can grow far beyond your own in the process of maxing out). Advantages: As some competitions are sorted into leagues by stats (and Defence is sometimes not considered because it can be difficult to factor for), Tank pets can gain an advantage by being able to block most of the damage done to them while still managing to do a decent amount of damage to their opponent. Disadvantages: Successfully battling a Tank pet requires good knowledge of how league formulas work (or a helpful friend who knows), access to good (sometimes expensive) defensive weapons and sound strategy. A noobinator is a general term to describe pets which have some sort of statistical disadvantage, but that still manage to defeat opponents with higher stats. There are some different stat builds which can still be considered a noobinator. Some noobinators will have an extremely low amount of HP coupled with high Strength, while some others just appear to be low-Level balanced pets. The most common trait of a noobinator is the use of a multiple use healer (such as Everlasting Crystal Apple). Advantages: This is more of a fun build for 2-Player battling. Disadvantages: Some despise noobinators (claiming them to be unfair), so if you don't want to hurt others' feelings you might want to stay away from this type of build. Also, to be a good noobinator you need a fairly big pocketbook and good battling strategy. Lab Rats are an unintentional pet build. They are pets who receive all their training through the use of the Secret Lab Ray. Two good signs of a Lab Rat are high HP coupled with moderate Strength and extremely low Level, and a non-default but not popular pet colour/species (such as a Glowing Uni). 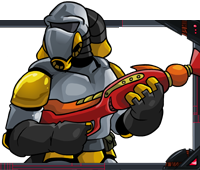 Usually, the reason Lab Rats are at such a disadvantage are because of not-so-great weapons; because their owner doesn't have enough Neopoints to actually train and purchase weapons for their pet they just purchase the Lab Ray, a one-time cost, and use that to train. Advantages: Training is free after the initial purchase of the pieces to the Lab Map. In addition, your pet's HP will never decrease from zapping. Disadvantages: The lack of control over training and randomness of changes could lead to an unlucky zap at a bad time. Additionally, if you decide to train your Lab Rat at one of the training schools after zapping for some time, it may cost quite a bit of NP train your pet into a more Balanced build. If you are just starting your Battledome career, I would recommend you choose a Balanced build (and don't forget to train defence!). For those short on NP, building a Lab Rat is another good choice that also has the chance for some good Customisation side benefits. As you gain more experience with battling, feel free to train your pet in whatever way you like most.